Get a quick, expert overview of the many key facets of today’s otolaryngology practice with this concise, practical resource. Dr. Luke Rudmik and a leading team of experts in the field address high-interest clinical topics in this fast-changing field. 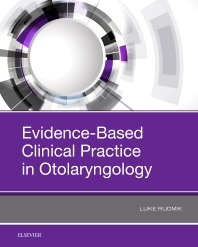 Presents an evidence-based, clinical approach to leading topics in otolaryngology. Covers key topics such as management of vertigo; management of adult sensorineural hearing loss; reflux in sinusitis; balloon catheter dilation in rhinology; epistaxis; functional rhinoplasty; sublingual immunotherapy for allergic rhinitis; pediatric obstructive sleep apnea; pediatric tonsillectomy; evaluation and management of unilateral vocal fold paralysis; management of hoarseness; endoscopic skull base resection for malignancy; management of glottic cancer; management of well-differentiated thyroid cancer; and management of the clinical node-negative neck in early stage oral cavity squamous cell carcinoma. Consolidates today’s available information and experience in this challenging area into one convenient resource.